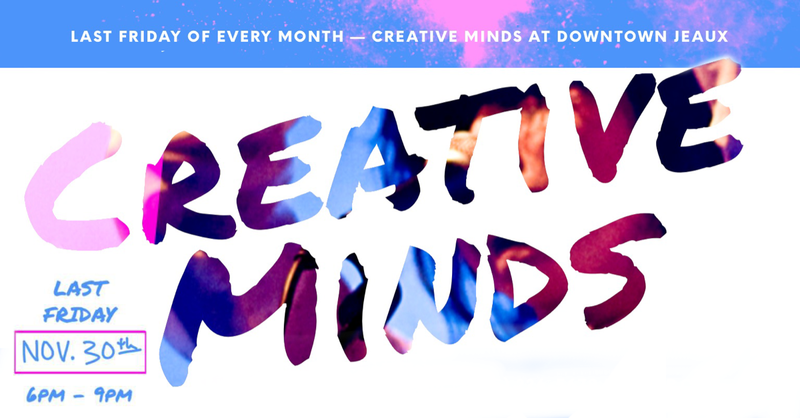 This Friday is Creative Minds: November. Since bringing the group back, we’ve been averaging 20-30 people from all different age groups. Singers, spoken word artists, doodlers, podcasters, sports reporters, and a bunch of kids that are looking to have a great time. This is just the beginning. I hope to see you there. November 30th (6-9pm) — Creative Minds is back for the month of November. I’ve partnered with Downtown Jeaux once again to bring the community together in fun and creative ways. Music, food, spoken word, painting, and gaming are just a few reasons to join us. If you need help with an idea, if you want to share something you’ve been working on, or if you’d just like to hang out with other cool people, this is the place to be. There’s two ways to keep up with this group: Mailing List and Facebook Group. We’ll have a mic setup for you to perform. Whether it’s an original or karaoke, the stage is yours. Bring your guitar, poetry book, or story to share. We look forward to hearing from you.